Truro City boss Steve Tully says his side must "refocus" on the league after being knocked out of the FA Trophy. 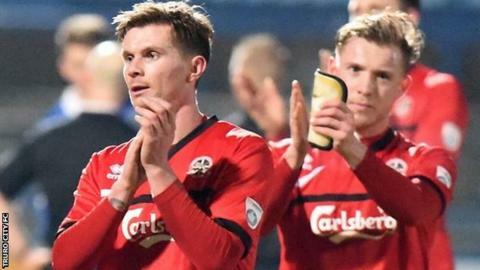 The White Tigers lost 2-0 at National League side Macclesfield Town in their second-round replay to end their best-ever run in the competition. "We'll concentrate now on the league, were in a good position," said Tully. "We've got a squad that's capable of going on and pushing and that's what we'll say to the players, they need to refocus and go again." The refocus starts with a home game with 10th-placed Maidenhead United, who are just three points off seventh-placed City. "It's going to be a tough game, we know that, but we're at home, we like playing at home and we'll do everything we can to go and win the game," he told BBC Radio Cornwall. "It's a squad game and between now and the end of the season every player in that changing room will be needed to perform at some stage and they've got to make sure that they're ready."